1 small sweet onion, sliced vertically and separated into "petals"
Slice lily bulb into "petals" and sauté in olive oil until crisp. Combine lily bulb petals with onion as a base. 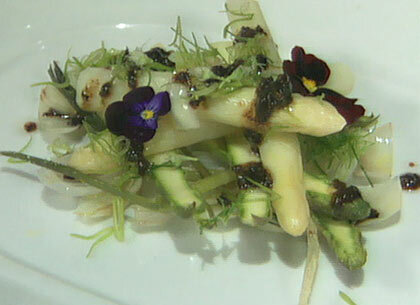 Layer with blanched wild onions, sliced green asparagus and sliced white asparagus. Top with sliced lily stems. Drizzle liberally with black bean vinaigrette (see recipe below). Suggested garnish: allium or chive flowers and pansies. Please note: When working with edible flowers, ensure that they have NOT been treated with any chemicals. This segment appears in show #3106.